A quick five question interview with Austin indie? pop trio LOVE INKS, who will be returning to Dallas for the Dirty Beaches show at City Tavern on Tuesday, May 5th. Sir Name and the Janes to open. 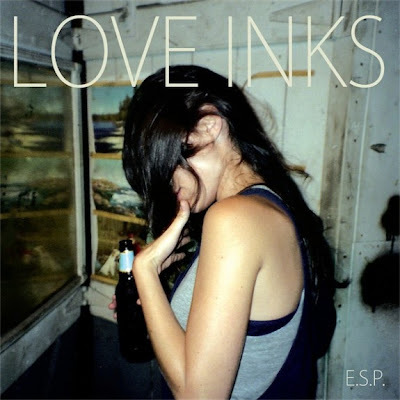 Love Inks debut E.S.P. comes out May 10th via Hell, Yes! and City Slang. 1) – A lot is happening for LOVE INKS recently, what’s behind the push? LOVE INKS: I think it’s just that we’ve had material coming out. Our single Blackeye was released on March 28th and the video was released a few weeks later. Our full length LP will be released on May 10th. We also started booking a tour and that helped open some doors. We’ll be all over the US, Canada and Europe this summer. 2) – Playing Dallas twice in less than a month! How did the Real Estate show come about? LI: The Real Estate show came about simply because I like their music. I saw that they needed a supporting act in Austin and e-mailed Martin, the singer in the group. He wrote back and asked us to support in Dallas as well. It was cool to play both shows with them and see how much the vibe can completely change from one city to another. Both venues/shows were great, just completely different worlds. 3) – Are you performing any other dates with Dirty Beaches? LI: No, but we’d always be open to it. We love his music and have played with Dirty Beaches once before at our SXSW label showcase. It was a combined Art Fag & Hell, Yes! showcase so we had the opportunity to play with a lot of talented artists. 4) – You three ever wear masks? LI: We haven’t yet, but I wouldn’t rule out the possibility. Unless you’re talking Slipknot style masks, then I don’t see that happening. Ever. I guess I’d be more likely to wear some psychedelic face paint before I put on a mask… it’d be too hard to sing. 5) – Why did you choose “Black Eye” as the first single of E.S.P.? LI: It just made sense. It’s probably the most upbeat song on the album. The 7″ is so so beautiful, our friend Andrew DeFrancesco took the cover photo and there are limited copies on white vinyl. Not to plug myself, but you can get the 7″ at http://www.hellyes.it/. I guess I’m mostly plugging our label, who put out really amazing vinyl for all of their artists. LI: When we come to the Dallas area, we always have to stop at Babe’s Chicken. That place is out of control… it’s the drug of the chicken world or something. We just added a drummer to our lineup and she’s vegan, so we’re going to have to find a new pit stop. Any suggestions? This entry was posted on April 27, 2011 at 12:21 am, filed under News.